Tonight, from 5:30 to 9:00 p.m., at Ross Barney Architects, 10 West Hubbard, there's an opening reception for a.DOT, architects doing other things, featuring the work of 50 female architects, sponsored by Chicago Women in Architecture. It's a part of Chicago Artists Month. There's a jury with Carol Ross Barney, Veronika Bocanova, Pam Hutter, Dorothy McCarty and Cindy Muller, so there must be a prize. There will also be a series of six lunchtime talks by the artists throughout October. 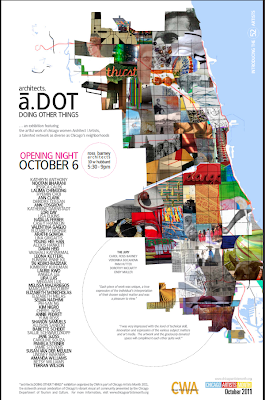 We are showcasing Chicago based women from the architecture and design community who see themselves as artists. The exhibit will feature a wide variety of art, including but not limited to paintings, sketches, sculpture, photography, mixed media, textile design, furniture, and jewelry design. Just don't expect to find a photograph of a squirrel eating a banana.